It was in sad shape. I'm not even sure how the clothespins were still staying in the bag. 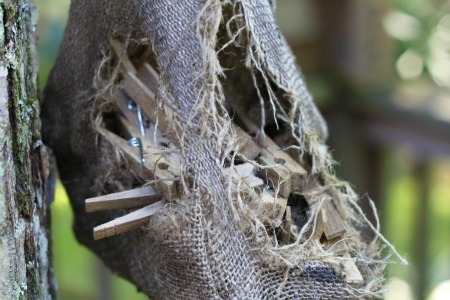 I decided it was high time I made a new clothespin holder, and I'm hoping the denim will hold up to the squirrels better than the burlap did. 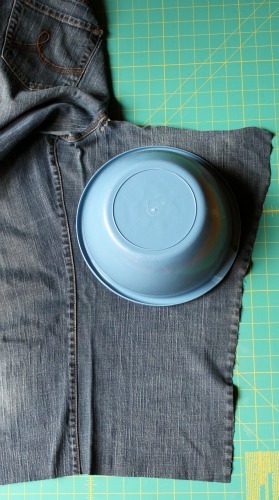 Step 1: You are going to use a pant leg from your jeans to create your bag. 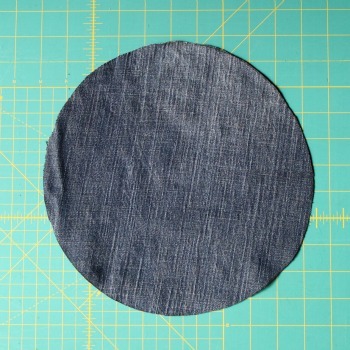 Lay out your pair of jeans and cut one pant leg 10.5" from the hem. 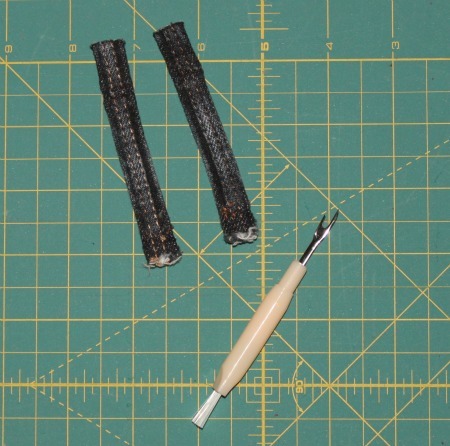 Take this piece and measure the width of the leg across the end where you just cut. Write this down... you'll need it in a few minutes. 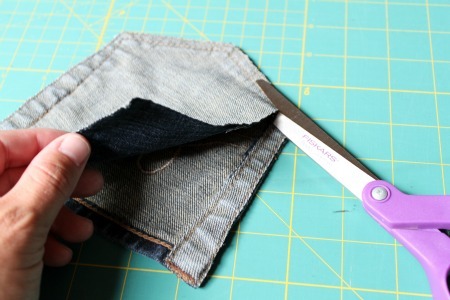 Going back to your pair of jeans, with your jeans laying front side down, cut right up the seam of the pant leg to get to the widest area of the leg. Cut across under the pocket to open up the fabric. Step 2: Now you will need your pant leg width measurement from Step 1. You need to determine what size circle to cut for the bottom of your bag. This can be done using the equation for circumference, C=(Pi)d, where we are looking for the diameter, d. If you are afraid of math... don't freak out! I'm a former math teacher; I'll walk you through it. You want to know what diameter to use, so take your measurement, multiple it by 2, and divide that by 3.14 (Pi). That will give you the correct diameter for cutting your circle. For example, my width measurement was 9.25". I multiplied that by 2 to get 18.5". I then divided that by 3.14 to get 5.89". I rounded that up to 6". Next, I took the very scientific approach of measuring every bowl I own to find one that is 6" in diameter. I traced that onto my opened up pant leg, then cut out my circle. 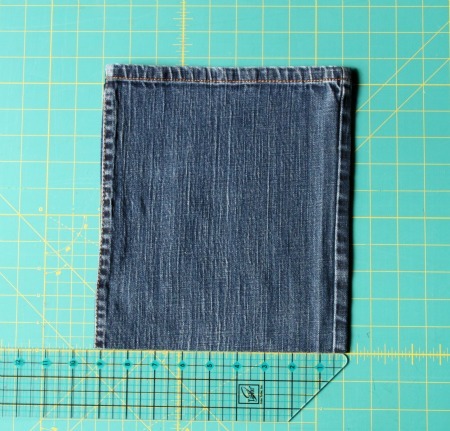 Step 3: Cut out one of the pockets on the back side of the jeans. 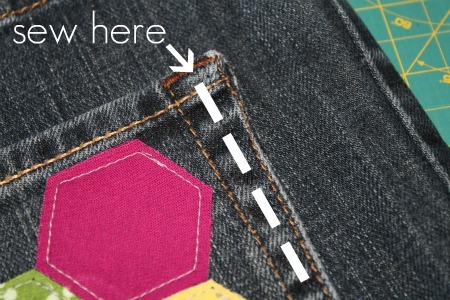 Cut as close to the edges of the pocket as possible. Cut off the back of the pocket. 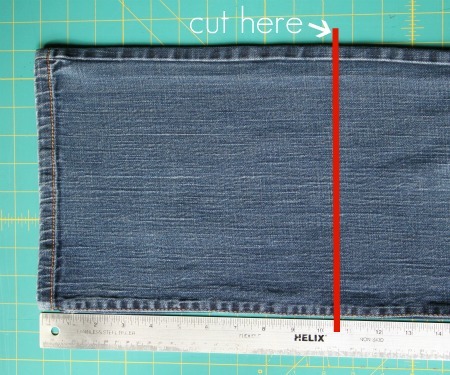 Cut as close to the seam as possible. Step 4: Time to decorate the pocket. The possibilities are endless, but here's what I did... I took four scraps of fabric and some paper-backed fusible web. I ironed the fusible web onto the back of my scraps, following the manufacturer's directions. 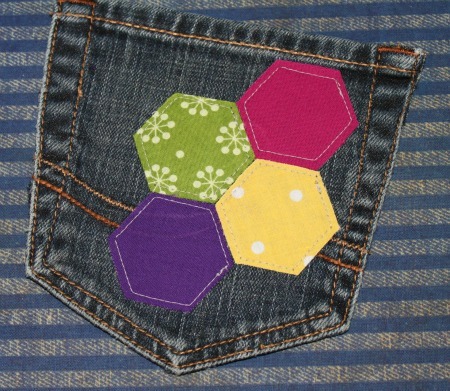 I then cut 2" hexagons from each of the scraps (I used my AccuQuilt GO! Baby fabric cutter, but you can use any type of die cutter or trace a template onto the fabric and cut the shapes by hand). 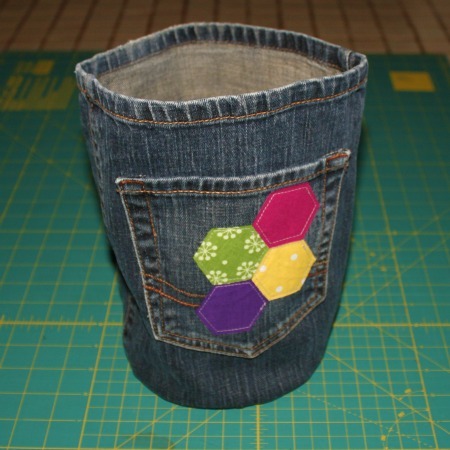 I removed the paper from the back of my hexagons, arranged them on the pocket, and ironed them in place. 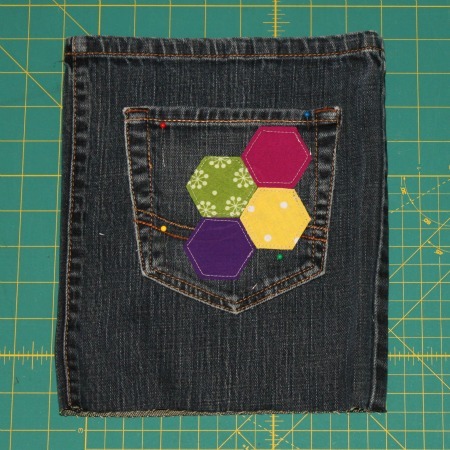 Finally, I sewed around each hexagon, about 1/8" inside the edges. Cute, huh? Step 5: Lay out your pant leg piece from Step 1 with the original hem of the jeans at the top (You'll be tempted to turn it around so the hem is at the bottom... don't). 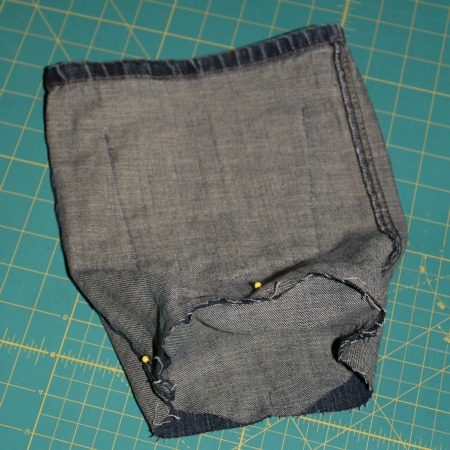 Position your pocket in the center on one side of the pant leg and pin in place. 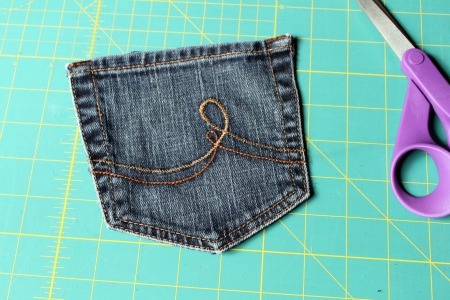 Sew around the edges of the pocket, leaving the top open. I use the front pocket to hold my clothesline spreaders (those things that keep the top and bottom of the clothesline from spreading too far apart when the clothes are hanging on the line). Hopefully it will not become a storage unit for a squirrel's winter supply of nuts and acorns. Step 6: Turn your pant leg inside out. Take your circle from Step 2 and mark every quarter with a pin. To do this, fold the circle in half vertically and place pins at each fold. Open the circle and fold in half horizontally. Place pins at each fold. 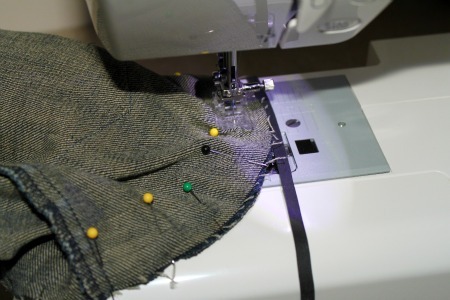 Do the same around the raw edges of your pant leg... place a pin at each seam and pins on both sides halfway between the seams. Match up the pins on your circle with the pins on your pant leg. Pin the two with right sides together at the four places where your pins meet up at each quarter. 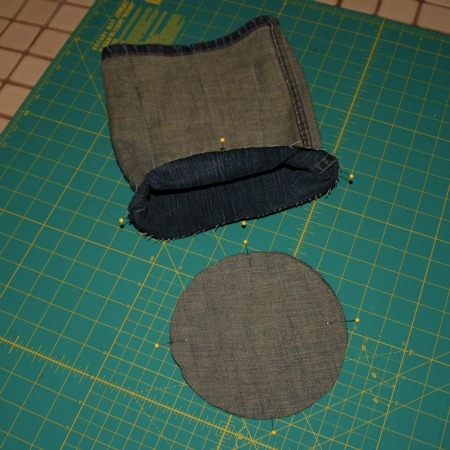 Add additional pins all around the edges, and sew around the edge using a 3/8" seam allowance. Step 7: Now you need some way to hang your clothespin bag. 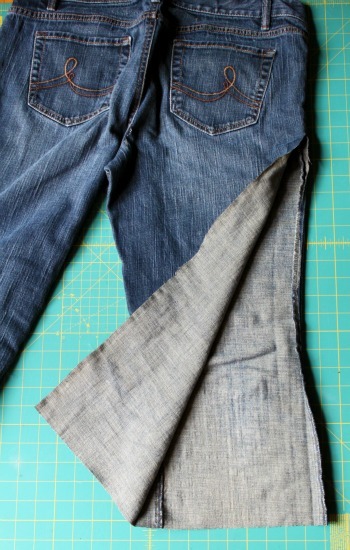 Using a seam ripper, remove two belt loops from your jeans. Loop one of the belt loops around and pin it to the inside of the back of the bag in the center, right at the top. 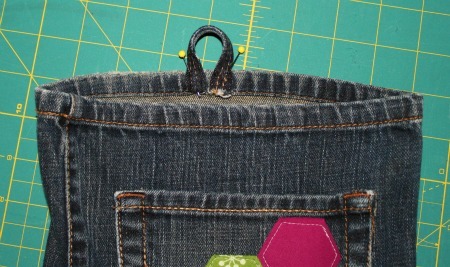 Loop the other belt loop around and pin it to the inside of the front of the bag in the center, right at the top. I added this loop to keep the bag closed when I'm not using it (and to discourage unwanted visitors from sleeping in it :). When I want clothespins, I just need to remove the front loop from the hook in order to get into the bag. Sew back and forth over both belt loops to secure. And guess what? You're done! Today is your last chance to enter the giveaway for the AccuQuilt GO! Baby! Giveaway ends 10/3 at 11:59pm (EST). I love your clothespin bag Gwen! A perfect use for old jeans. Yes indeed, very cute! And your old clothespin bag...hahaha. Wow, very well used! 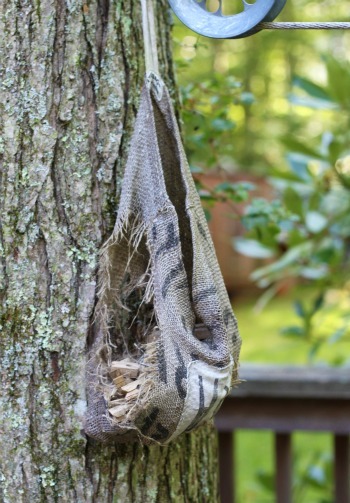 Wow, those squirrels sure did a number on your burlap bag! :-) But I sure love your version! I can't believe you've never sewn with denim! Denim was the first thing I ever sewed with and I still love using it... I can't throw away old jeans so the majority of the stuff in our storage shed is old, no longer wearable jeans waiting to be made in to something great someday. 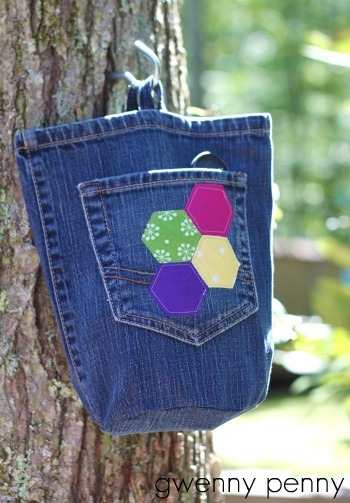 The bag looks great, and the hexies are the perfect touch! That is great! And it looks so summery hanging in the yard. 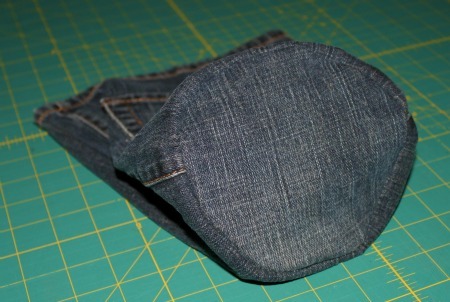 I love the durability of denim, and this is a great way to re-use old jeans. Thanks for the tutorial! Amazing! LOVE your scientific method for finding the correct template for the base circle! I love this. I made two. One for myself and one for my brother. He's very pleased with his. @Helen Moore - I'm so happy to hear that!